Don’t Miss the Countdown Deal Days for Cameron Bane’s Suspense Thriller PITFALL! 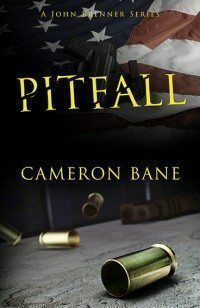 For a limited time, get the first book in Cameron Bane‘s suspense thriller series, PITFALL, for only 99cents beginning Wednesday, June 29th! But hurry, the price will gradually increase after each day of the countdown. PITFALL is the story of former Army Ranger John Brenner, a wounded Iraqi war vet and ex-cop. Brenner finds himself face to face with a ruthless killer on a mission that hasn’t gone quite as planned. Get your copy here! Still smiling, his knuckle grew white as it tightened down on the Glock’s trigger, taking up the last half-ounce of slack as his eyes flickered his intent. Sarah moaned in fear. And then everything stopped as my Browning roared, its round rocketing six feet across the room and straight into his open blue eye. The bullet mushroomed as it hit, growing instantly from the size of a pea to the diameter of a gumdrop. That’s what hollow points do. As the round exited his head at that short distance the entire back of his skull vanished in a spray of pink and gray, his gun flying free and unfired from his limp hand as he slumped to the floor, deader than four o’clock. And then Sarah started screaming again.